Published in the Dover Express, 1 May, 1981. The east end of the church was extensively damaged by shelling in 1941 and the east window blown out. This was replaced after the war by a new one designed by Martin Travers, Thirty years later the three old bells were taken down, two of them recast and the other tuned and restored. The latter bell, thought to be about 530 years old, is the oldest in Dover. Three smaller bells were added at the same time to make a chime of six bells. There was another restoration in 1975 when the church was redecorated and upon the closing down of the old Buckland School its bell was transferred to a place of honour in the church. Buckland Churchyard has, for many years past, ceased to be a burial place. The churchyard is reached through a very handsome covered lychgate, in which there are seats. On the well kept greensward in 1906 there were still several very old headstones, which had resisted the effects of weather remarkably; one in memory of Mary Gurner, who died in September 1635; another to James Wood, who died 1692; and another to Ann, the wife of William Wood, who died June 1733. On the higher ground, on the south side, under the spreading chestnut tree, was erected a headstone in memory of Mrs Jane Wilson, who died at Buckland, 12th August, 1849, aged 92 years. It was in the newspapers, at the time of her death, that she was a native of Canterbury, but had been resident for many years at Buckland. She had paid three different clergymen to bury her. To one she gave, in addition, all her plate. Two of them left Dover previous to her death. She had paid the undertaker for her funeral three years before she died. Adjoining the old churchyard, westward, and on the higher ground to the south, is Buckland Cemetery. Two prominent buildings on Grabble Hill are Buckland House, a solidly built property on the south side, which is about 200 years old and has been occupied by a number of interesting people. The other is The Shrubbery, latterly the Coleman nurses' home, opposite the mill. Buckland House was built for Ingram Home and occupied by his son, Thomas, who took over the running of Buckland Paper Mill in the early days of the 19th century. He was followed by Major Cokayne Frith, who rented the house from 1879. Major Frith’s three sons all served in the Army. Lieutenant Frederick Frith, adjutant in the 17th Lancers, died in action in Zululand in 1879. A brass plaque in St Catherine’s Chapel, at Buckland Church, records his death and that of Major Frith’s third son, Reginald, who died as a result of an accident in 1900 when he was Commandant of the Cavalry Depot, The King’s Hussars, while stationed at Canterbury. Major Frith was a great worker for Buckland Church until his death in 1901, and was on the board of managers of the old Buckland School. Proprietor of Leney’s Brewery at Dover, Mr Alfred Leney subsequently lived at Buckland House until his retirement to Saltwood. He and his wife would walk to church across the garden and the riverside meadows crossing the river toy a small bridge to Buckland churchyard. The church contains a memorial window to Alfred Leney’s father. It was placed in the north aisle by his grateful tenants. It is recorded that in his time, when the streets of Dover were watered in summer, to keep down dust, by watering carts filled from hydrants, there was an accident involving Mrs Leney. On her way to a garden party she was riding in an open carriage towards the bridge when someone accidentally turned on a hydrant and she was drenched! The man responsible would not have been allowed to forget his mistake by Mr Leney. Wiggins, Teape and Company bought the property and adjoining land in 1908 but until 1910 the house was let to a Dr Noble. Then, for 25 years, Mill manager Mr Lewis Hobday made the house his home. When Crabble Hill was widened in 1911 and the garden wall of Buckland House was pulled down an interesting find was made. The foundations of a very old brick house of considerable size were found. Nothing seems to be known about it and apparently no one consulted an archaeologist about the find. The original property known as The Shrubbery, near the foot of Crabble Hill, is thought to have been built for a famous British seaman, Admiral Sir John Bentley. Made a lieutenant in the Navy in 1734 he was later given the command of the Invincible, which he had helped capture from the French, and in 1759 he was knighted for his part in defeating a French squadron. Later, under Hawke, he was involved in another defeat of the French, off Brittany, which ended the Seven Years’ War. It was when he retired about four years later, after over 40 years’ service that he came to Dover. The Admiral lived out his days at The Shrubbery, dying in 1772. Before his death he worked for Buckland Church, being a churchwarden and member of the Vestry. His distinguished career and his association with Dover is marked by a large marble tomb in the south-west corner of the church. The Shrubbery was next occupied by Mr and Mrs William Hills and then it was acquired by Mr William Horne, of Buckland, who demolished what is said to have been a fine old house and built a modem one, setting it farther back from the road in spacious grounds. From Mr Home the property passed to Mr Coleman, whose father was the farmer at Priory Farm, now the site of Dover College. The new owner renamed the house Coleman House and left it in his will to Dover Hospital as a convalescent home for patients. The house was rebuilt in 1921 and rented to the Ministry of Health for use as a nurses’ home. Private housing development has recently taken place in part of the grounds of the property. Buckland Estate, composed largely of council housing, was commenced in the 1930s, the first houses being those in Pilgrims’ way, Knight’s Way, Prioress Walk and Shipman’s Way. Most of these dwelling were in the parish of River, which, at that time extended very nearly as far as the Old Park Hill railway bridge. The effects of the Second World War completely changed the aspect of the remaining land which had hitherto been agricultural, the principal landowner toeing Major Murray Lawes, of Old Park, who conveyed the land known as Buckland Valley Farm to the Corporation on 5th July, 1946. Vast estates of prefabricated housing had already been erected to serve the needs of those who had been shelled out of the town itself. The last of the single-storey “prefabs“ disappeared as late as the mid-1970s and they are still remembered with much affection by many of the community who formerly lived in them. There are tangible reminders of this era in two-storey “prefabs“ still standing, including those in Dryden Road and Vancouver Road. "It was a pleasant place, looking across the meadows to the large and elegant house (the mill house) and beyond the meadows to the railway there were orchards and a nursery garden. 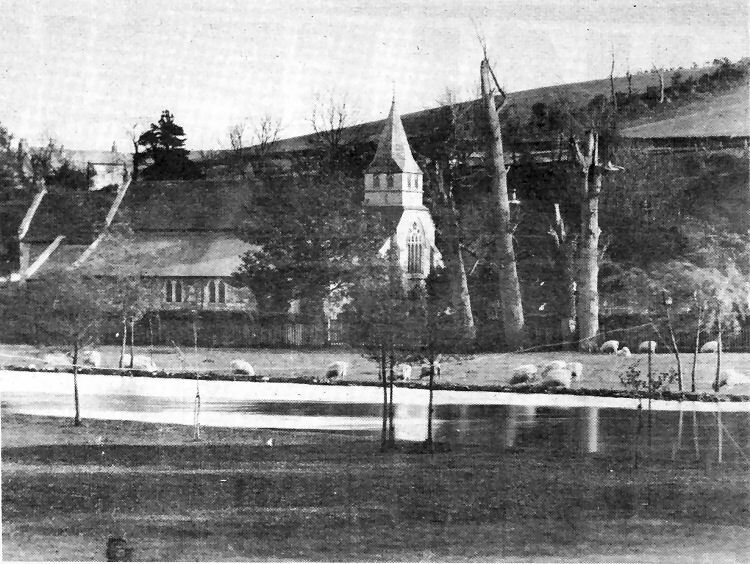 I don’t suppose we had a minister for the environment in those days!“ The photograph was taken after 1880 which was the year the yew tree was moved and the church extended to the size shown. The church alley, or footpath to Crabbier was behind the fence running across the centre of the picture. By the lychgate was an iron gate and a small “kissing gate“ to the-footpath.